Visitors! | A Guy, A Girl, and a Really Old House! My young adult life was blessed to include many supportive adults, all of whom I believe were instrumental in making me the person I am today. Besides my parents, who are the best, and excellent teachers, I had great adults at church. Jami and Becky in particular helped guide me through those atrocious middle school years and into the much better high school ones. They encouraged me to sing and to develop my faith… And told funny dating stories! The Scarborough DHH Ladies took me in as one of their own when I was just 17, engendering in me a lasting passion for the Deaf community and inspiring me to eventually attain my Master’s Degree. Another adult who fits into this category was my university campus minister, Ira. He served as a spiritual leader, confidant, and friend through my four years at school and beyond. He took me to get my tattoo while on a mission trip in Alabama. Four years ago he even presided at our wedding. Well, you can imagine my excitement when Ira emailed last week to say that he and his wife, Barb, were going to stop on Tortola while on their Caribbean cruise! 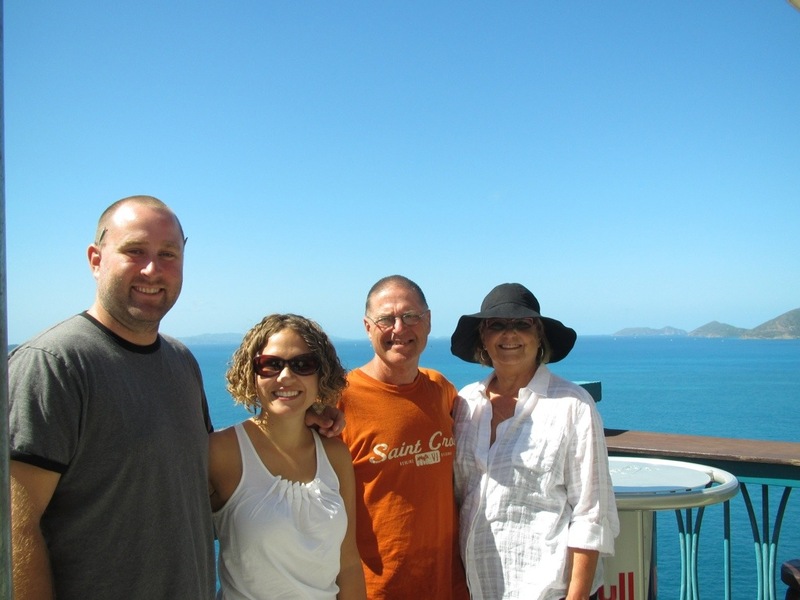 We met Ira and Barb at the Cruise Pier in Tortola and drove west along the coastal road to Soper’s Hole. We walked around the marina, had a coffee, and looked at some boats while catching up on Baker, family news, and life on Tortola. Ira had requested that we show them the most beautiful parts of our island. They’d been to Tortola on a previous cruise, so they’d seen the beautiful Baths on VG. (In fact, Ira was the first person we heard from after we got the jobs here who had actually been here!) From there it was off to Soper’s Hole for an hour or two, which was perfect! At 10am we had the beach to ourselves. It was still chilly by Caribbean standards, but it did warm up enough for Ira to take a dip in the water. From there it was off to Bananakeets for brunch. We usually take guests there for sundowners, but Ira and Barb had to be back on the boat by 1 or so. We’d never actually eaten at Bananakeets before, but it was delicious! And, we all toasted the beautiful weather, the beautiful view, and time together My young adult life was blessed to include many supportive adults, all of whom I believe were instrumental in making me the person I am today. Besides my parents, who are the best, and excellent teachers, I had great adults at church. Jami and Becky in particular helped guide me through those atrocious middle school years and into the much better high school ones. They encouraged me to sing and to develop my faith… And told funny dating stories! The Scarborough DHH Ladies took me in as one of their own when I was just 17, engendering in me a lasting passion for the Deaf community and inspiring me to eventually attain my Master’s Degree. Another adult who fits into this category was my university campus minister, Ira. He served as a spiritual leader, confidant, and friend through my time at school. He took me to get my tattoo while on a mission trip in Alabama. Four years ago he married Tony and me! Well, you can imagine my excitement when Ira emailed last week to say that he and his wife, Barb, were going to stop on Tortola while on their Caribbean cruise! We met Ira and Barb as the Cruise Pier in Tortola and drove west along the coastal road to Soper’s Hole. We walked around the marina, had a coffee, and looked at some boats while catching up on Baker, family news, and life on Tortola. Ira had requested that we show them the most beautiful parts of our island. They’d been to Tortola on a previous cruise, so they’d seen the beautiful Baths on VG. (In fact, Ira was the first person we heard from after we got the jobs here who had actually been here!) From there it was off to Soper’s Hole for an hour or two, which was perfect! At 10am we had the beach to ourselves. It was still chilly by Caribbean standards, but it did warm up enough for Ira to take a dip in the water. From there it was off to Bananakeets for brunch. We usually take guests there for sundowners, but Ira and Barb had to be back on the boat by 1 or so. We’d never actually eaten at Bananakeets, but thankfully, it was delicious! And, we all toasted the beautiful weather, the beautiful view, and time together with a PK. I think Barb and Ira enjoyed seeing parts of the island for which there is no cruise-sponsored excursion, and we enjoyed the time with dear friends! Ahhh….thanks Lindy, for your kind words. I’m glad I had a positive influence on you. And I’m so proud of who you’ve become!!! I bet Ira & Barb loved their visit! Just today before Chapel Ira was telling me about their visit with you! So happy for them to get to spend time with you guys. And, thanks so much for kind words – it was an honor, priviledge and joy to watch you grow from that wonderful young middle schooler into the phenomenal young woman you are now! !